Author Carly Kade wins a second WINNIE Award at the EQUUS Film Festival. The Best Equine Romance literary award was presented to Cowboy Away in New York City at the sixth annual EQUUS Film Festival. The EQUUS Film Festival is the leading showcase for domestic and international equestrian content including feature films, shorts, documentaries, music videos, commercials, training, educational materials, art & literature. It is beyond my wildest dreams to be featured in the Winter issue of Chrome Magazine. 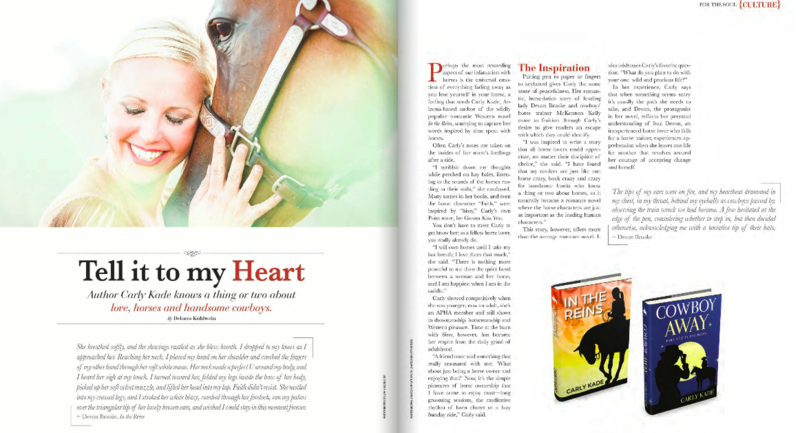 A BIG thank you to Rachel Florman for showing interest in me, my writing and my Paint horse so many months ago and to Delores Kuhlwein for writing such a beautiful article about my journey as the author of In the Reins. 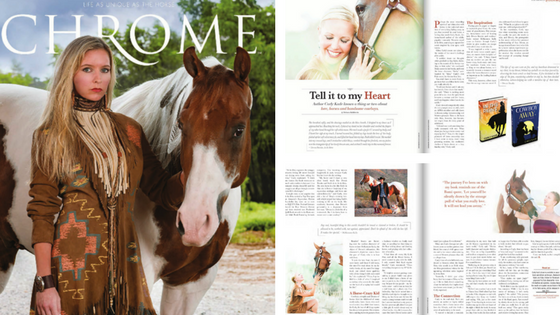 Read an excerpt of the story featuring photos taken by the talented Melanie Elise Photography at APHA.com. ​Equestrian romance novel, In the Reins, is featured as a recommended honeymoon read in the Wedding Issue of Horse & Style Magazine! It is such an honor to see my equestrian romance in the pages of the publication. A special thank you to Laurie Berglie of Maryland Equestrian and contributor to H&S for seeing In the Reins as an equestrian romance worth featuring as a honeymoon read! ​The Feathered Quill Book Awards has presented author Carly Kade with two Silver Medals for her equestrian fiction novel, In the Reins. ​Fresh off of her EQUUS Film Festival Literary Award win for Best Western Fiction, Carly adds the two Feathered Quill nods in the Romance and Book featuring Animals - Adult categories to her horse book' s growing roster of honors. Author Carly Kade's novel, In the Reins, has won the EQUUS Film Festival Best Western Fiction WINNIE Award. The award was presented in New York City at the fourth annual EQUUS Film Festival. Did you enjoy In the Reins? Please spread the word! When you enjoy a book share your thoughts on Amazon and other book reviewing channels like Barnes & Noble, iBooks and Kobo. It is the easiest way to thank the authors you love and signal to them (and their publishers) to write more books! Check out the Infographic for 5 facts you might not know about authors and why it's so meaningful to them that their readers leave reviews of their books. Tweet! Tell others about In The Reins on Twitter by retweeting posts from @CarlyKadeAuthor or create your own posts using the hashtag #InTheReins. Share the love story! Give the gift of a signed copy to a friend. Fill out my contact form below for details! Invite me to speak at your event, write a guest post on your blog, or do a Q&A on your podcast! I'd be happy to support. Contact me! ﻿Interested in an interview, want to request a guest post on your blog, or a Q&A on your podcast? Write for a blog, mag or paper? In the Reins? Let me know! 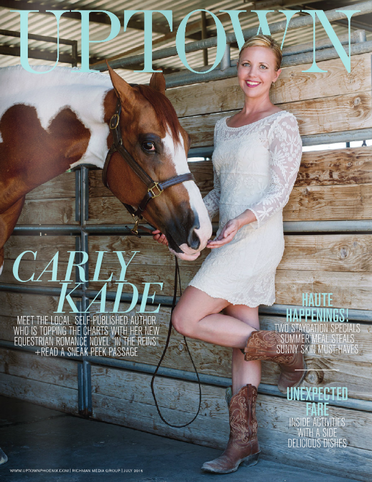 ﻿Carly Kade is an award-winning equestrian author from Arizona. Creative writing makes her spurs jingle! She writes fiction about horses, horse shows, western pleasure and a handsome cowboy or two. Her books are for people just like her ... crazy about reading, horses and cute cowboys! ​In her free time, Carly enjoys competitively showing her registered Paint Horse, works on her next novel, reads voraciously, spends time with her husband and two adopted dogs, and loves exploring the great outdoors. Carly's novel inspired by the equestrian lifestyle has been an Amazon bestseller for more than 10 weeks, is an EQUUS Film Festival Literary Award Winner for Best Western Fiction and has earned two Feathered Quill Book Awards in the 'Romance' and 'Books Featuring Animals - Adult' categories. ​Deeply romantic and suspenseful, In the Reins captures the struggle between letting life move forward and shying away from taking the reins. Passionate, captivating, and full of equine epiphanies, this is a love story sure to touch your inner cowgirl. Watch Carly Kade Creative Videos on YouTube and visit the blog too! 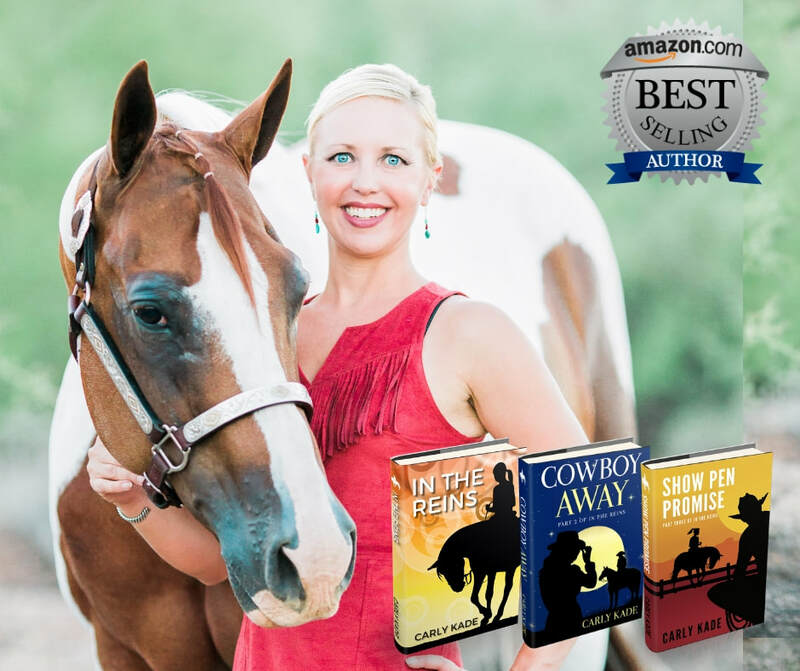 [PHOENIX, Ariz.], February 14, 2019 - PRLog -- The Feathered Quill Book Awards has presented author Carly Kade with the Bronze Medal for her equestrian romance novel, Cowboy Away. Fresh off of the book’s EQUUS Film Festival Literary Award win for Best Equine Romance, Carly adds the Feathered Quill nod in the ‘Book featuring Animals - Adult ’ category to her growing roster of literary honors. In 2017, In the Reins, the first book in her series for horse lovers, won two Feathered Quill Book Awards in the ‘Romance’ and ‘Book featuring Animals - Adult ’ categories. PHOENIX - Dec. 11, 2018 - PRLog -- The EQUUS Film Festival has named author Carly Kade as the 2018 WINNIE Award winner in the Best Equine Romance category for her novel, Cowboy Away. The award was presented in New York City at the sixth annual EQUUS Film Festival. Carly received her first WINNIE Award in 2016 in the Best Western Fiction category for In the Reins, the first book in her series. PHOENIX – October 30, 2018 - PRLog – Cowboy Away, written by Carly Kade and narrated by Amanda Lamb, is now available in audiobook format on Audible, iTunes and Amazon. Cowboy Away is the highly anticipated sequel to the EQUUS Film Festival Best Western Fiction Literary Award winner & two-time Feathered Quill Book Award recipient, In the Reins. “I feel so fortunate to have had the opportunity to spend more time in this beautiful world that Carly brought to life for a second time in Cowboy Away, the sequel to In the Reins. We really get to hear from cowboy McKennon Kelly, and fall even deeper in love with him in this second book,” said Amanda Lamb, narrator of the In the Reins audiobook series. PHOENIX - March 28, 2018 - PRLog - In the Reins, written by equine author Carly Kade and narrated by Amanda Lamb, is now available in audiobook format on Audible, iTunes and Amazon. Carly's novel inspired by the equestrian lifestyle has been an Amazon bestseller for more than 10 weeks, is an EQUUS Film Festival Literary Award Winner for Best Western Fiction and has earned two Feathered Quill Book Awards in the Romance and Adult Book featuring Animals categories. PHOENIX, Ariz., - Nov. 27, 2017 - PRLog -- Equine author Carly Kade announces the paperback and eBook release of Cowboy Away, the second book in the In the Reins horse book series. Cowboy Away is the highly anticipated sequel to the EQUUS Film Festival Best Western Fiction Literary Award winner & two-time Feathered Quill Book Award recipient, In the Reins. PHOENIX, Ariz., - Feb. 3, 2017 /PRLog/-- The Feathered Quill Book Awards has presented author Carly Kade with not one but two Silver Medals for her equestrian fiction novel, In The Reins. Fresh off of her EQUUS Film Festival Literary Award win for Best Western Fiction, Carly adds the two Feathered Quill nods in the 'Romance' and 'Book featuring Animals - Adult ' categories to her book's growing roster of honors. Feathered Quill is one of the preeminent book review sites on the internet. The submissions for the Feathered Quill Book Awards come from all types of publishers from self-publishers to the major New York publishing houses. PHOENIX, Ariz., November 21, 2016 /PRLog/ -- The EQUUS Film Festival has named author Carly Kade as the 2016 WINNIE Award winner in the Best Western Fiction category for her novel, In The Reins. The award was presented in New York City on Sunday, November 20th at the fourth annual EQUUS Film Festival. The EQUUS Film Festival is the leading showcase for domestic and international equestrian content including feature films, shorts, documentaries, music videos, commercials, training, educational materials, art & literature. The selected authors and their literary works competed last week for the chance to win a WINNIE Award viewed as the EQUUS Film Festival’s equine equivalent of the Oscars. Go behind the scenes of the EQUUS Film Festival in New York City with Author Carly Kade. She attends the four day equestrian extravaganza beginning with the VIP Gala & culminating at the equine equivalent of the Oscars called the Winnie Awards! PHOENIX, Ariz., November 1, 2016 /PRLog/ -- The Desert Foothills Library is hosting their annual Arizona Authors Showcase featuring Carly Kade, author of the In The Reins, on November 15th from 10 am - Noon. The Desert Foothills Library is located at 38443 N. School House Rd, Cave Creek, Arizona 85331. Carly has been chosen as one of four local authors who have been invited tell their stories and discuss their books at this popular yearly event. Books will be available for sale and signing. Books range from $10 to $20. The library will serve cake and tea to celebrate the authors. Admission to the event is free. SCOTTSDALE, Ariz., July 11, 2016 /PRLog/ -- Equestrian author and American Paint Horse Association member Carly Kade has penned a novel to pay homage to western pleasure for fans of breed horse shows. Since its release at the end of 2015, In The Reins, a cowboy romance novel inspired by the equestrian lifestyle, has steadily climbed the charts to rave reviews. The book has been an equestrian best seller on Amazon for more than 10 weeks. Arizona author Carly Kade’s first book, “In the Reins,” has been an Amazon best seller for more than 10 weeks. It's an EQUUS Film Festival Literary Award Winner for Best Western Fiction and earned her a loyal group of followers. Married with a full-time job, she shows her Paint horse and is mom to two adopted dogs, but Carly still finds time to write. In fact, "Cowboy Away," the sequel to her first book will be out this year. She juggles a successful career and pursues her dream as a freelance author, and today, Carly is going to tell us how she does it! The biggest HORSEY online holiday event of the year is happened on Cyber Monday, November 27th! Carly Kade speaks with hosts Glenn the Geek and Author Lisa Wysocky during the Equine Author Hour to discuss her new book, Cowboy Away, on the 3rd Annual 12 Hour Live Horse Radio Network Holiday Radiothon. Over $4,000 in equine related prizes were given away on November 27th. In the Reins, is featured as a recommended honeymoon read in the Wedding Issue of Horse & Style Magazine. Monty Roberts EQUUS Online University in conjunction with the Horse Radio Network presents an online radio show (podcast) dedicated to the exploration of good horsemanship throughout the world. Hosted by Monty Robert's daughter, Debbie Roberts Loucks, the show includes segments, tips and interviews exploring good horsemanship. In this Horsemanship Radio interview, Author Carly Kade talks about her book, In The Reins, and its recent EQUUS Film Festival WINNIE Award win for best Western Fiction on the Horse Radio Network show. Speaking of Horses TV Host, Wayne Williams, interviews Author Carly Kade at the EQUUS Film Festival in New York City. They talk horses, writing and about the success of her novel, In The Reins, in the first 5 minutes of this video segment filmed at the fest. In this interview on Horse Radio Network, Author Carly Kade talks about her book, In The Reins, and its recent EQUUS Film Festival WINNIE Award win for best Western Fiction. HORSES IN THE MORNING is the first live morning show with an equine theme. Its a light, lively, entertaining daily look at the horse world and the people in it. The show includes entertaining conversation, out of the ordinary guests, numerous regular horse related segments, listener call in, contests, giveaways and so much more. ﻿Horse Nation resident book reviewer Eileen Cody finds even her self-described anti-romance "jaded millennial ways" warming up to "In The Reins," a barn-set romance by Carly Kade featuring a cool-eyed cowboy and of course plenty of horses. Check out the review from Horse Nation, a site designed to allow crazy horse people to indulge their obsessions within a community of like-minded crazy horse people! Carly pens a guest post for Whiskey Tales, a Western lifestyle blog. In the post, she chronicles inspirational moments from her recent horseback riding ‪trip to Jackson Hole, Wyoming‬! Read her post called, "Jackson Hole, Wyoming: The Perfect Cowgirl Getaway for a Cowboy Romance Author" by clicking the button below. In this unique interview, Carly answers questions through Sydney Scrogham's Dreamer Spotlight Series where readers learn about the super powers Carly wishes she had, a time when the author almost gave up on writing In The Reins and her advice for anyone dreaming about penning a horse book! 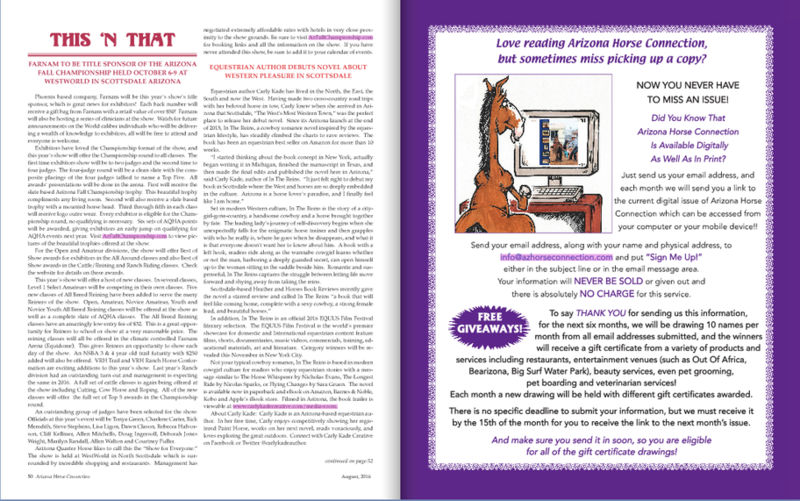 Arizona Horse Connection magazine August issue! Find the write up on 'In The Reins" on page 50. 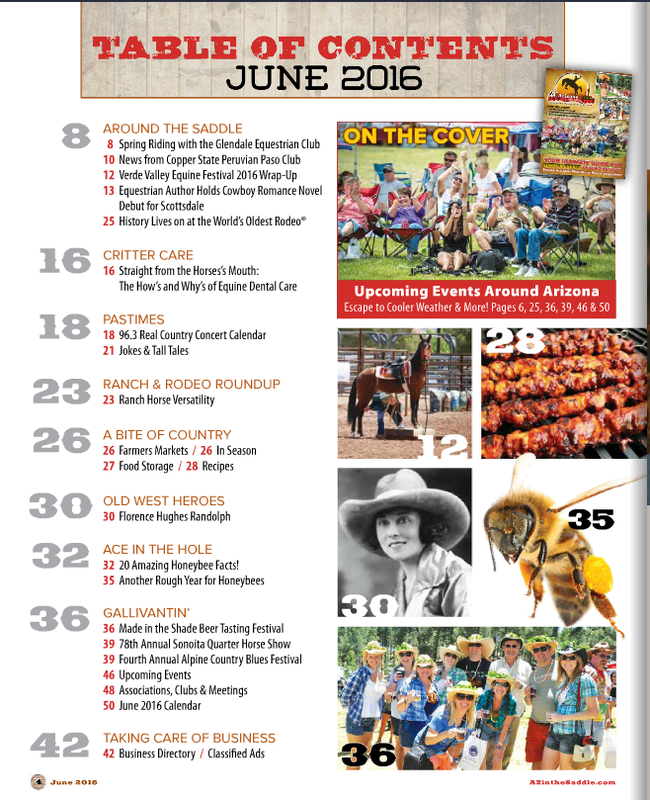 Arizona Horse Connection magazine June issue! Find the write up on 'In The Reins" on page 44. ﻿Scottsdale Health magazine June issue! Find the write up on 'In The Reins" in their Life Secti​on on page 41. As the event's official author, Carly will appear during the EQUUS Film Festival Tour Stop in Sedona, AZ. to meet with readers and conduct book signings of her EQUUS Film Festival literary award-winning books, In the Reins. and Cowboy Away. As the event's official author, Carly will appear during the EQUUS Film Festival Tour Stop in Sedona, AZ. to meet with readers and conduct book signings of her EQUUS Film Festival literary award-winning book, In the Reins. American Horse Publications (AHP) has held an annual conference for its members since the 70s. The three-day equine media event is jam-packed with educational sessions, special events, and the announcement of the AHP Equine Media Awards. Sessions cover publishing trends, journalism, sales and revenue building, marketing, and much more. The conference is the number one place in the equine industry to network with the equine media and members of AHP. Verrado High School has invited me to be a speaker at their first annual Women's Day. The event is designed to encourage young girls to be more self-confident and self-reliant. As such, they have invited several prominent women who make and have made an impact of the state of Arizona to come and share their inspiring stories with students. Visit me on Sunday, March 11th during the Tucson Festival of Books. At 10:20 a.m. I'll be giving a Tent Talk and starting at 12:15 p.m. I'll be at the Festival to chat with & sign books for readers. I'll have copies of 'In The Reins' and its sequel, 'Cowboy Away', available for sale, too. Author Carly Kade partners with Copper Country again this year! Carly will be making an appearance to chat with and sign books for readers on Saturday, December 30th during the Exhibitor Dinner. She will have copies of the EQUUS Film Festival award winner for Best Western Fiction and Amazon Equestrian Bestseller, In the Reins, as well as, the highly anticipated sequel, Cowboy Away, available for purchase right at the show! Already have a copy? Bring your book for a signature from the author during the show. The biggest online holiday event of the year is happening on Cyber Monday, Nov. 27th starting at 9 am Eastern. Carly Kade be a featured guest on the 3rd Annual 12 Hour Live Horse Radio Network Holiday Radiothon. Over $4,000 in equine related prizes will be given away on Nov. 27th including a WeatherBeeta North America Blanket Gift Pack and your choice of any Wintec Saddle. Carly Kade will be appearing on air live at 6:30 pm Eastern on 11/27 during the Equestrian Author hour. Visit www.HolidayRadiothon.com for all the details on how to “ENTER TO WIN” the $4,000 in prizes and “HOW TO LISTEN." The Phoenix Writers Club has invited Carly Kade to discuss her journey as a best-selling equestrian fiction author. During the event, she will share her unique perspective on self-publishing. Are you thinking about self-publishing your next book? Bring your questions! Carly will provide you with ideas and inspiration for publishing and promoting your next book. Phoenix Writers Club Monthly meeting is every third Saturday of the month from 12 pm to 2 pm at Bluewater Gill located at 1720 E. Camelback Rd, Phoenix, AZ. Come enjoy lunch and a monthly guest speaker. The cost is $20.00 for members and $25.00 for guests. BreyerFest is Breyer Animal Creations' annual celebration of horses at the Kentucky Horse Park - a fabulous three-day family festival that combines the excitement of a horse fair with model horse activities! For 28 years, BreyerFest has brought thousands of people together to enjoy and experience the world of horses. The Tucson Festival of Books is a community-wide celebration of literature. Offered free-of-charge, the Festival exists to improve literacy rates among children and adults. All proceeds for the Festival support local literacy programs. Visit me on Sunday, March 12th starting at 2:30 pm. I'll be at the Festival to chat with & sign books for readers. I'll have copies of In the Reins available for sale too. I'm ringing in the New Year with a book signing at this horse show! Visit me on Sunday, January 1st starting at 10 am. I'll be at the show to chat with & sign books for readers. I'll have copies of In The Reins available for sale too. Already have a copy? Bring it along! I'd love to sign your book for you. In The Reins is an official EQUUS Film Festival literary selection. Carly will appear in the Literary Corner to meet and greet, sell books and conduct book signings at the EQUUS Film Festival in New York City 2016 in the Pop-Up Gallery venue. The EQUUS Film Festival is the world’s premiere showcase for domestic and International equestrian content feature films, documentaries, shorts, music videos, commercials, training, educational materials, art & literature. Many books showcased at the festival go on to sign movie deals. A Literary Contest will be conducted in the 2016 EQUUS Film Festival program. WINNIE Awards will be distributed at the event for winning literary works. Carly Kade is one of four local authors who have been invited tell their stories and discuss their books at this popular annual event. Books will be available for sale and signing. Books range from $10 to $20. Please bring cash or checks. The library will serve cake and tea to celebrate the authors. Carly Kade will sell and sign copies of In The Reins for readers during the Scottsdale Livestock Customer Appreciation Day on Saturday, October 15th from 8 am to 5 pm. You don't want to miss this event there will be plenty of vendors, special deals, giveaways, raffle prizes, games, live music and complementary BBQ & beverages!